Pain and tattoos have always been associated with one another for as anyone can remember. Part of the process of getting inked is enduring the pain of having a multitude of needles repeatedly piercing your skin, and ending up with a meaningful piece of art that you wear all the time. In some cultures, tattoos - and the pain that comes with getting them - are a rite of passage, and a symbol of one's rank or position in a tribe or community. Throughout history, tattoos and pain have always come hand in hand. While getting tattooed today seems considerably less painful thanks to modern technology, you still expect some degree of hurt whenever you visit your local tattoo parlor. For many tattoo fanatics, the pain that comes with getting inked makes the entire experience all the more worth it. If you think about it, getting pain-free tattoo is pretty much like having a permanent sticker pressed against your skin; nothing special about it. If you are truly serious about getting a tattoo, you must be willing to take the pain. But pain is relative. One person's pain threshold is different from another person's. Some say that women are more capable of enduring pain because many of them have experienced childbirth, but most men argue that they are just as capable of taking it as they are giving it. Everyone's opinion differs. However, from a medical and physiological standpoint, some parts of the human body feel less pain than others, and are thus the preferred area for people who are just getting their first ink. Whether it be your upper arm or lower arm, most people agree that this is one part of the body that is least painful to get a tattoo. Aside from being a prominent area for you to proudly show off your new ink, it also happens to be one part of your body that has relatively dense skin, and plenty of muscle to absorb the pain. There are plenty of great sleeve designs that you can go for, and you can cover a large area of skin while only having to deal with a relatively small amount of pain. 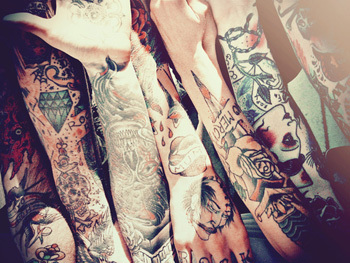 If you do go for a full sleeve tattoo, remember that most sleeves cover the entire arm, including the elbows. Getting a tattoo on your elbow will feel a tad more painful because there is relatively less muscle in this area, leaving your bones to absorb the brunt of the pain. The shoulders are a bit tricky when it comes to tattoos. While the upper shoulders feel considerably less pain because of the thick shoulder muscles, the part of the skin that sits on top of your shoulder blades can feel pain from the sharp tattoo needles because of its proximity to the bone. Shoulder tattoos look great on their own, but with a little imagination they can also be incorporated into sleeves and back tattoos. If you are looking to get your first tattoo, but you don't want it displayed on your arms because of some ridiculous rule at work, or you just want to be a little more discreet about it, then a shoulder tattoo is your best option. 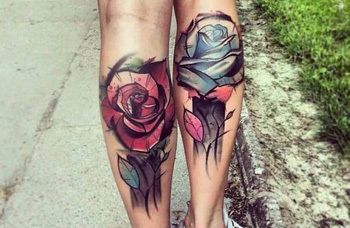 Your leg muscles are extremely efficient at lessening the pain that comes with getting a tattoo. Since most people have more fat and muscle on their legs and thighs than just about any other part of their body, these areas are capable of withstanding the pain that comes with getting inked. Just be careful not to let your tattoo design reach your inner thighs. This area tends to be fleshier, but because they are close to the erogenous zones, they also tend to have more nerve receptors that send both pain and pleasure signals to the brain. So go ahead and get that awesome steampunk biomech tattoo on your outer thighs, but expect some discomfort once the needle hits your inner thighs. Just like your thigh muscles, your leg and calf muscles are great at absorbing pain. You might feel a little discomfort once the needle starts piercing the part of the skin on top of your shin bone, but pain on the rest of the lower leg should be tolerable. In fact, leg sleeves are slowly become just as popular as arm sleeves. You can go as far down as getting your ankles tattooed and feel a little pain, but if you go even lower and decide to have the tops of your feet inked, expect to feel considerably more pain in this area. 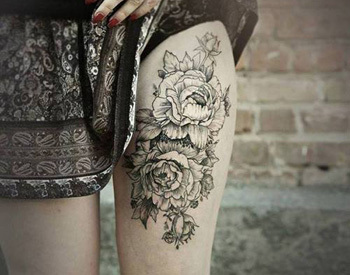 You also want to avoid the knee area if you do not have much experience with tattoos, as this area also has fewer muscles and more bone to absorb the pain. For people who are getting a tattoo for the first time, some parts of the body to avoid are the chest, knees, and neck area. If you feel that you've gotten past the pain of getting inked in the above-mentioned areas, then feel free to explore other parts of your body. After all, the pain is part of the process. No pain, no gain. Also, remember that one person's tolerance for pain differs from the next, and just because your friend told you that he felt no pain while getting the bottoms of his feet inked, doesn't mean you won't feel pain either. When it comes down to it, get your advice from your tattoo artist. He or she will always be in the best position to tell you which parts of the body hurt more based on your perceived pain tolerance.